When I vacationed on Amelia Island, I bought a coloring book, called "Color Me Calm." I thought coloring would be a great activity to use to self-soothe myself and to keep me present and mindful in the moment. Both of which are DBT skills. 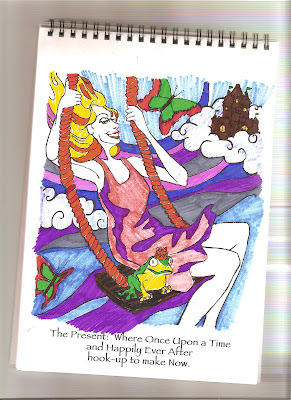 It states, "The present: where once upon a time and happily ever after hook-up to make now." I love it! I imagined myself as the woman in the swing. I have long, strawberry blonde hair and yesterday I enjoyed swinging at the park-another thing I hadn't done in a long time. No kids were at the playground and my hips hurt, so I decided to take a break from walking and swing instead. It was fun and I enjoyed feeling the wind as I went back and forth. The pink dress I colored actually reminds me of a similar pink dress I got from Target. I wore it last year at the Renaissance Festival. Dress: Target Rainbow Tank Top: JCPenney Hat is from the Ren Fest. I'm just trying it on, because I thought it looked funny. I think I was enjoying the moment that day too.